Toys R Us has won its court battle with Amazon, breaking up a partnership that was formed in 2000 and allowing the toy firm to set up its own retail website. A judge found that Amazon, one of the largest online retail sites, had not honoured its contract with Toys R Us. Amazon allowed other firms to sell toys through its website, despite Toys R Us have an exclusive agreement to do so. Amazon argued it had no choice as Toys R Us did not carry enough stock and failed to offer the most-popular goods. Company spokesperson Patty Smith said Amazon strongly disagreed with the ruling and was examining its options regarding the decision. The partnership between Amazon and Toys R US was seen by many as a key milestone in attempts to connect traditional retailers and internet companies in what became known as "clicks-and-mortar" relationships. However since then, market conditions have changed and many toy retailers have faced difficulties as discount companies such as Wal Mart offer the same or similar products at lower prices. FAO Schwartz declared bankruptcy and sought protection from its creditors in December 2003, only to be followed the next month by KB Toys. 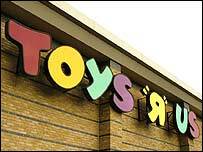 Toys R Us launched its court case against Amazon in May 2004. In 2005, Toys R Us was sold for $6.6bn (£3.7bn) to Global Toys Acquisition, a private equity consortium comprising Bain Capital Partners, Kohlberg Kravis Roberts and Vornado Realty Trust. Shares in Amazon, which also sells books, DVDs, cameras and homeware, closed 0.65% down at $36.88 on Thursday.